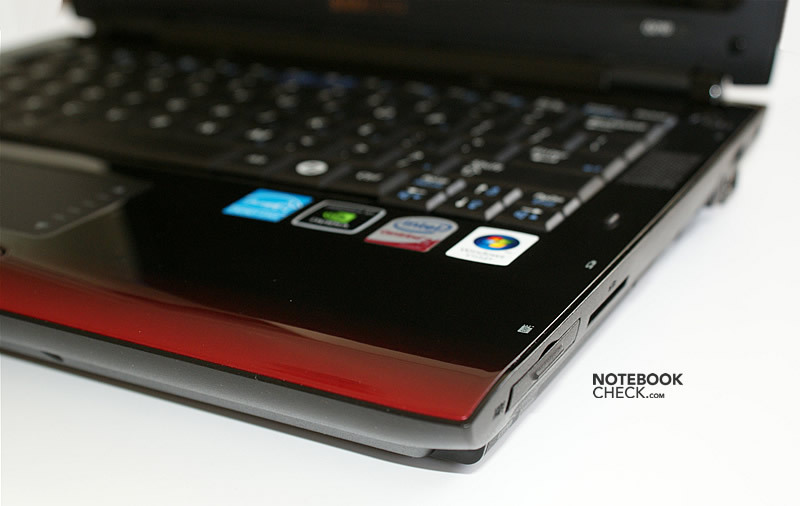 Recently Samsung launched a number of new notebooks based on the Montevina platform. The Koreans are going to expand and penetrate new markets, foremost the US market. 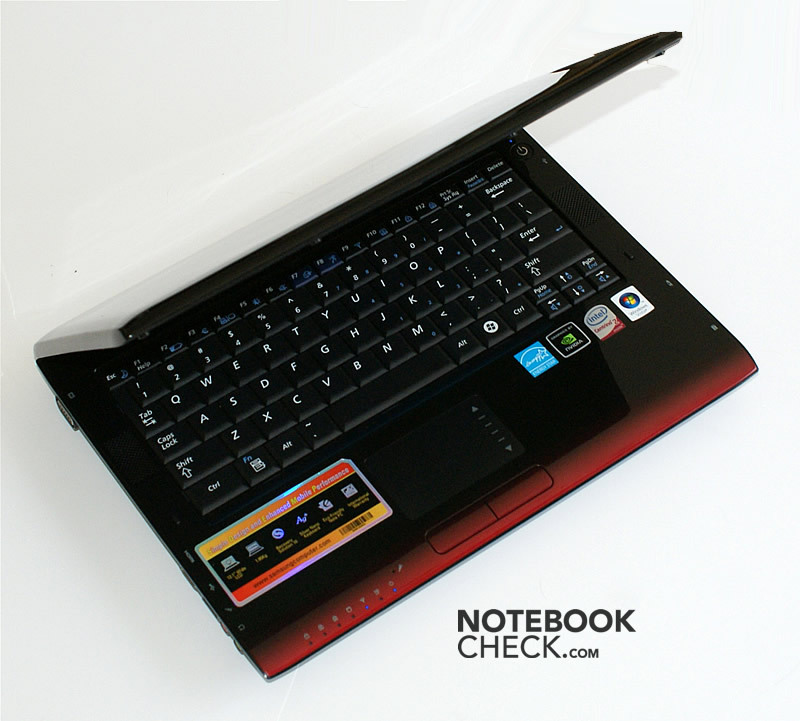 We want to check whether these new laptops are likely to survive in competition with other notebooks. 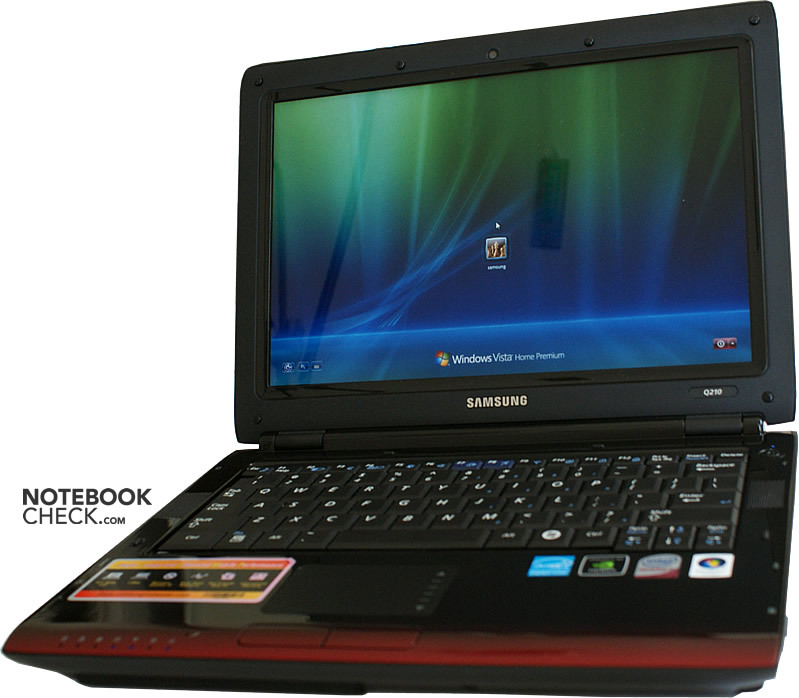 Let's start with the compact and mobile 12 inch notebook, the Samsung Q210. 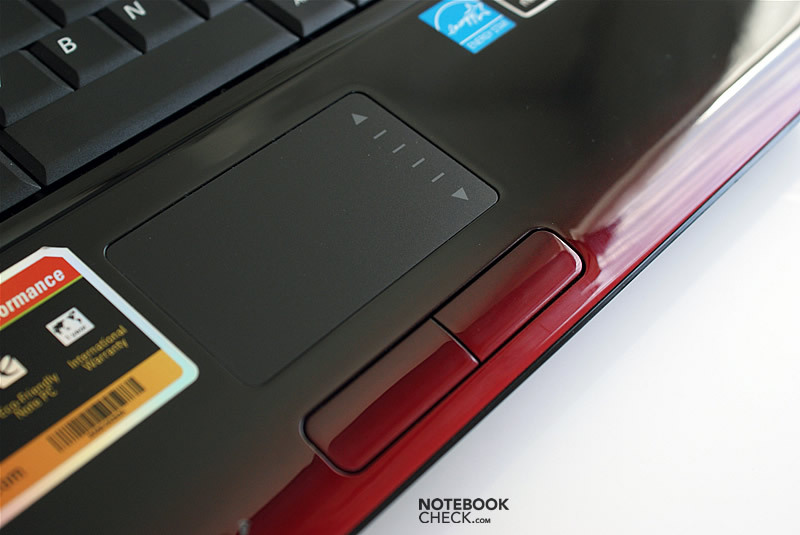 Many thanks to our Polish editor team from notebookcheck.pl, who tested this notebook and kindly provided us with their review. 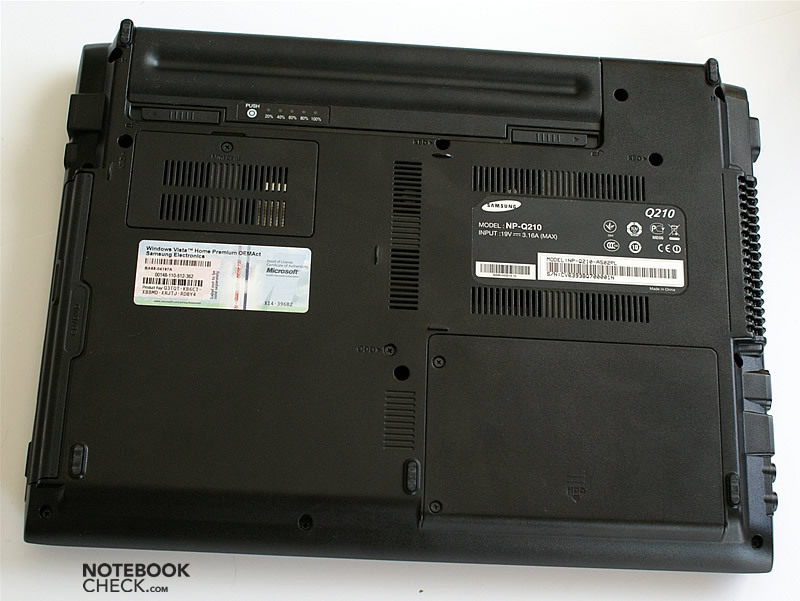 Once again Samsung designed a black notebook. This models can be distinguised by a contrasting red stripe in the front part of the top case. Unfortunately most parts of the top case, luckily except of the keyboard, have a glossy finish, which is sensitive to fingerprints. 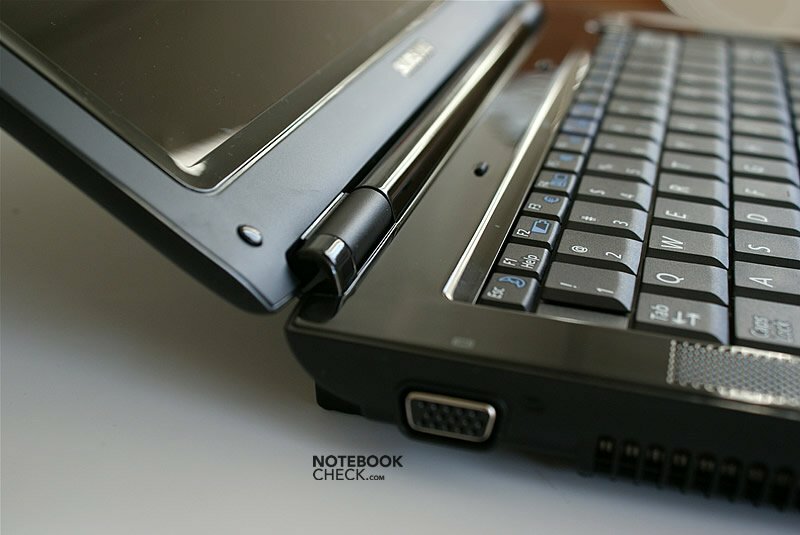 If you pick the notebook up and handle it with only one hand, you can sometimes hear a creaking. Nevertheless, the case is rather rigid and does not give, if you do. But, the plastic of the top case gives if you take it between thumb and index finger and press. It is easy to move the lid. Maybe it even opens a little too easy - at least this was our first impression. Nevertheless, the hinges hold the screen luffing-free. Still, they can be easily moved by the user even with only one hand. The maximum opening angle is 140 degrees, which is sufficient. 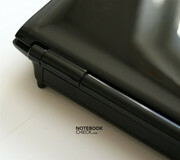 A magnet prevents the lid from opening by itself, even if the notebook is turned upside down. So, the Samsung Q210 does it without a transport hook. 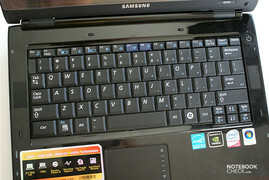 The keyboard of the Samsung Q210 does not utilize the whole width of the already small laptop. So, the keys are not really big. But unless the user has to type several hours a day, the keyboard is acceptable, especially considering that typing is really comfortable, because the key travel is short and the key feedback is hard, but not too hard. Furthermore, the keyboard is well mounted and does not give. What annoys most is that the keys clatters quite sonorously if you type fast. Thereby, dot, slash and semicolon, and the rather small space bar are the loudest keys. 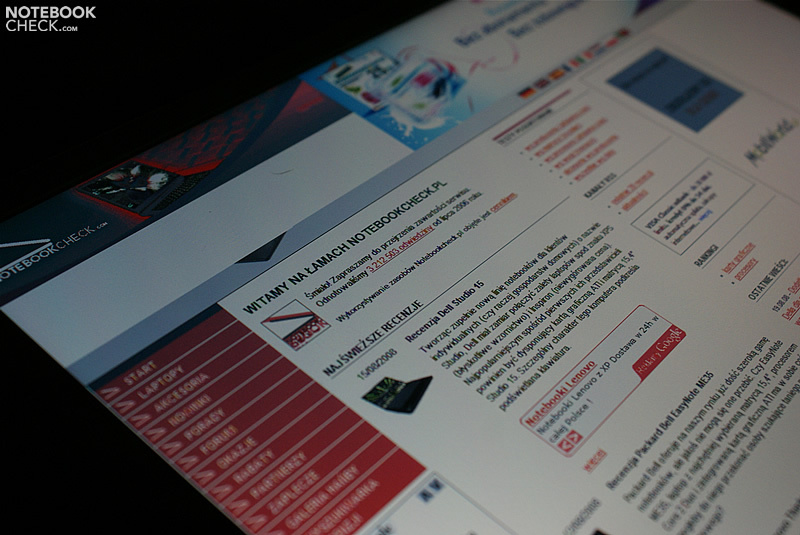 Although the touchpad is also rather small, it is excellent. 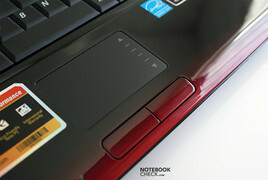 Its surface is smooth and moving the finger on it feels nice to the touch. Furthermore, the pointer moves very precisely. Also the mouse buttons gave a positive impression, because they are easy to press and have a short travel. In contrary to the right one, the left button is pleasingly quiet. 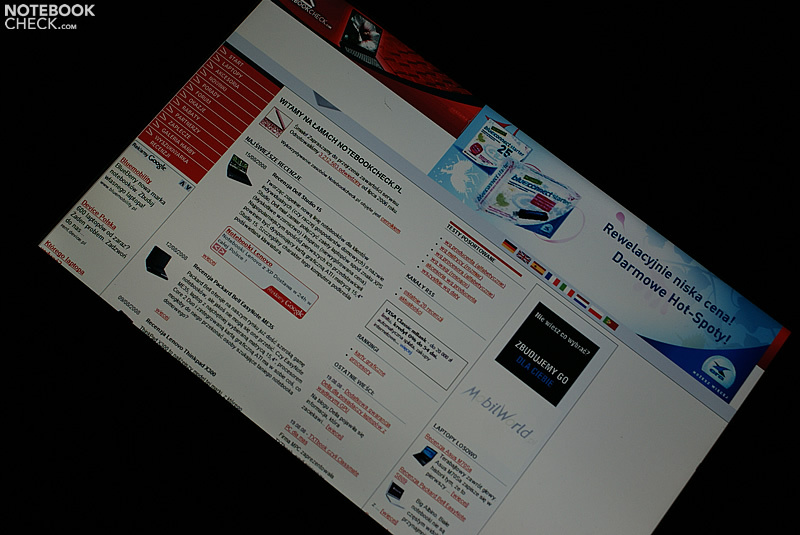 The 12” screen can be considered as one of the weakest points of the Samsung Q210. 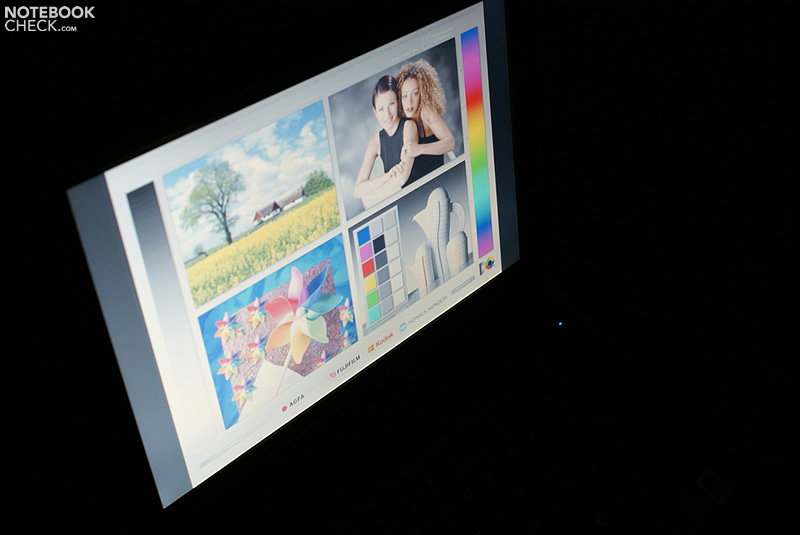 But, not because the results of the measurement are bad, but rather because other subnotebooks are often equipped with screens with LED backlight nowadays. On the other hand the native resolution of 1280x800 pixels (WXGA), which equiponderates readability and desktop size, is a clear pro. 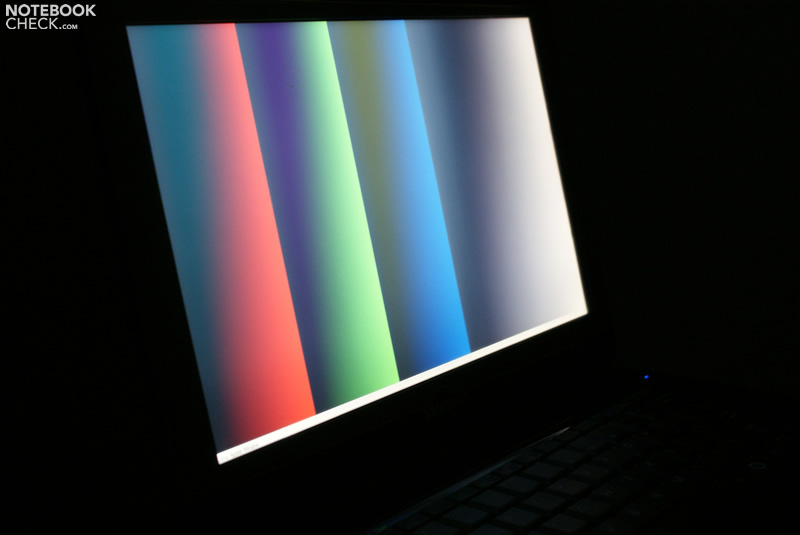 The Brightness of the screen is with an average of more than 180cd/m² acceptable. A weak point is the poor contrast, which amounts to 134:1. 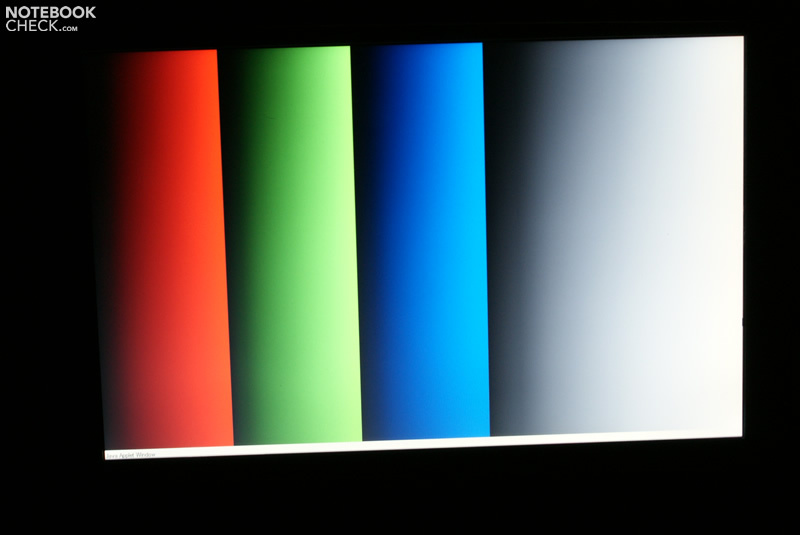 The colour appear cold, because a faint blue gradient shows up here and there. 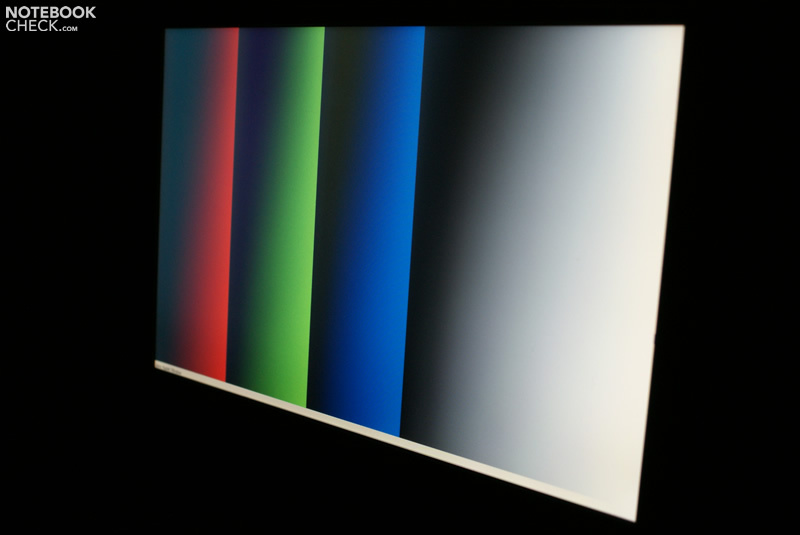 The colors are well saturated, but in our opinion less true than for example the colours of the HP Pavilion tx2550's matte screen. 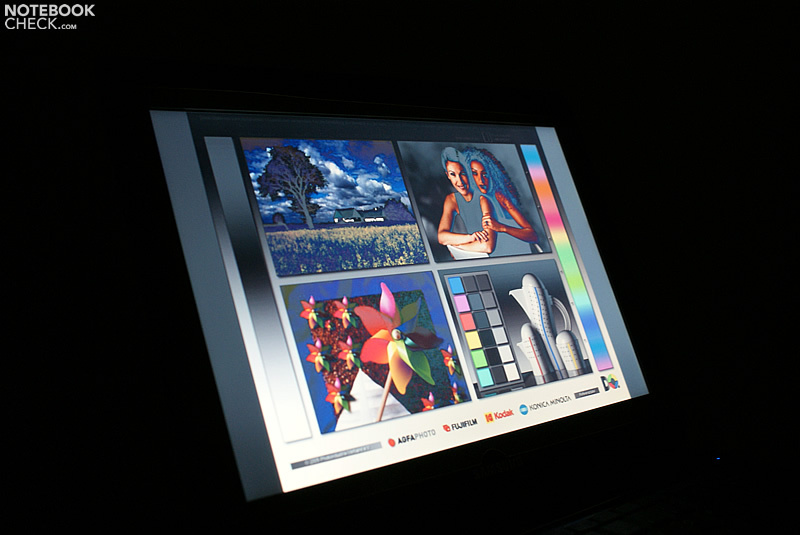 The reviewed model is based on Intel's Montevina (second generation Penryn) platform. 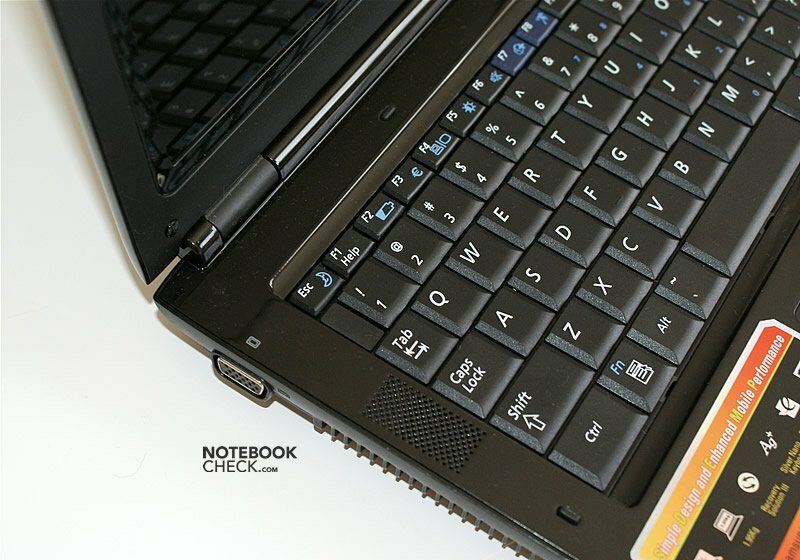 Since the Core 2 Duo P7350 hasn’t been announced beforehand, it was a surprise to see it in this notebook. After experiencing the latest Penryn CPUs it seems that it was a wise choice by Samsung. The Core 2 Duo P7350 has low heat emissions (TDP of 25W), and offers sufficient performance to deal with demanding applications. Its clock frequency is 2.0GHz, its FSB is 1066MHz, and the level 2 cache is 3MB large. According to our tests the P7350 is slightly faster and consumes less power than its predecessor, the T7300 with 2GHz, 800MHz FSB, and 4MB level 2 cache. 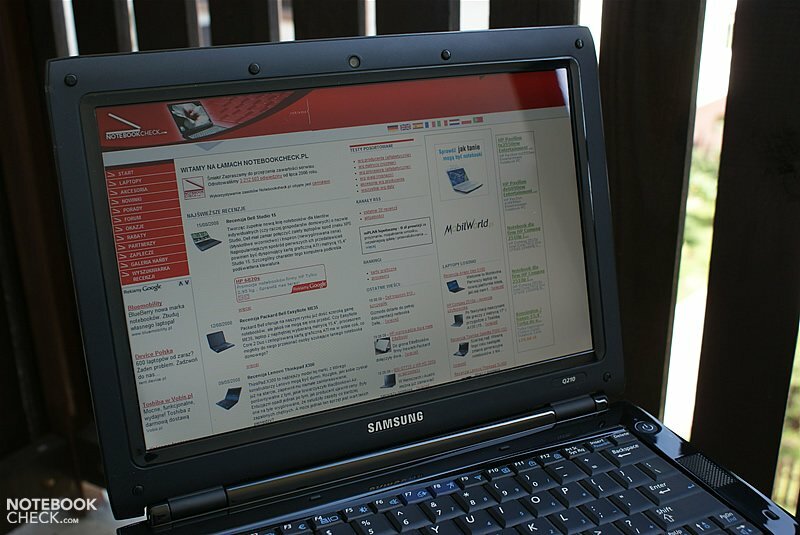 Overall the Samsung Q210 showed a similar performance level as a different system with a T8300 and 3GB of DDR2-667 RAM. A nVidia GeForce 9200M GS is responsible for all graphics related tasks. Usually GS stands for mediocre performance, similar to the GeForce 8400M GS or the ATI Mobility Radeon HD 2400. However, the 9200M GS is available in two versions, a slower one with GDDR2 VRAM and a faster one with GDDR3 VRAM, which is built into the Samsung Q210. Although it is even with GDDR2 VRAM still not a high-end card, it is at least on par with cards like the ATI Mobility HD 2400XT or X1600. Considering that about two years ago cheaper mainstream gaming notebooks were using these cards, the GeForce 9200M GS is more than fast enough for a subnotebook. The Samsung Q210 is very quiet with only 32dB in idle mode, caused by a faint hum of the mechanical hard drive. 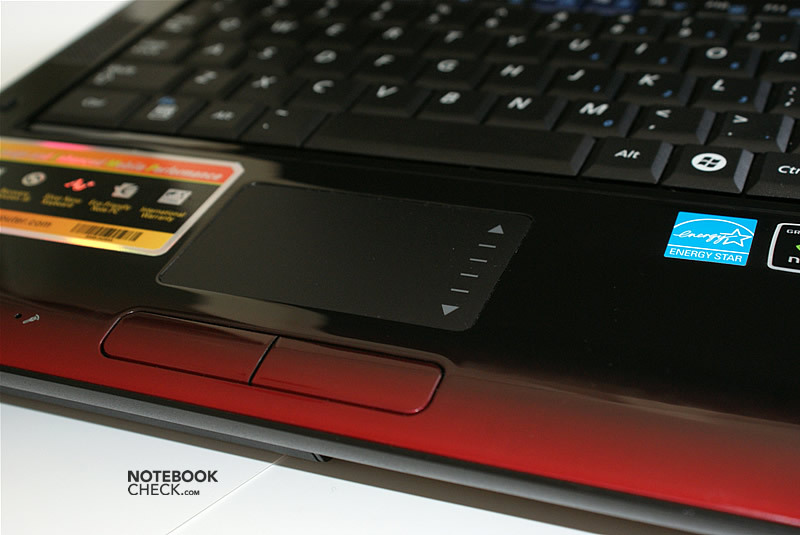 It probably could have joined Samsung's range of virtually silent notebooks with a solid state disc, but even 32dB is almost inaudible. 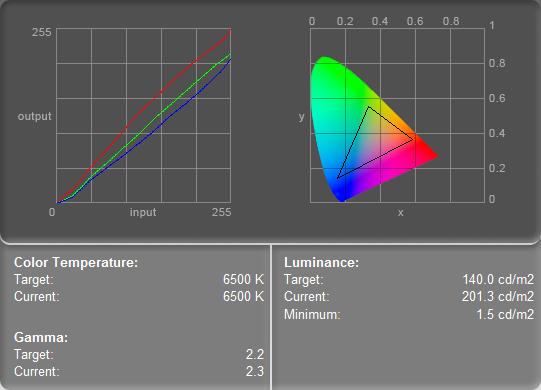 The noise level rises under light load to 32.5dB and to 33dB under stress, because the (quiet) fan starts to spin up. 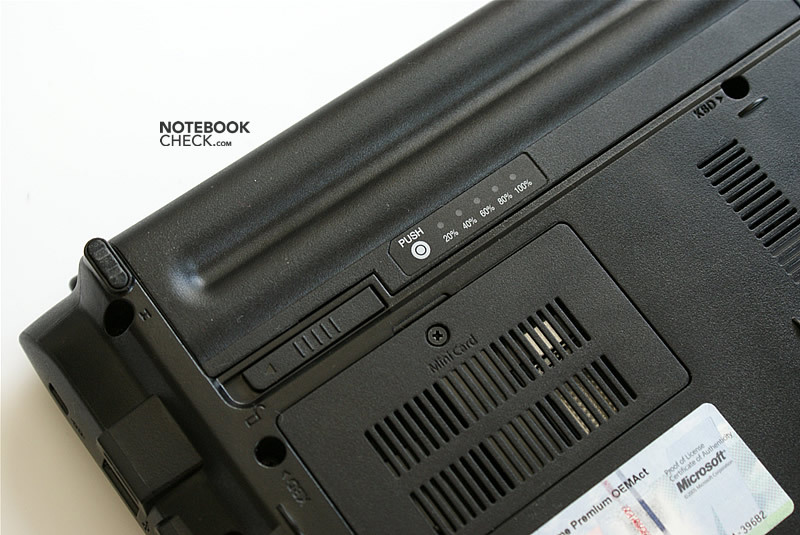 In reality these results mean the notebook keeps very quiet, no matter how hard it has to work. 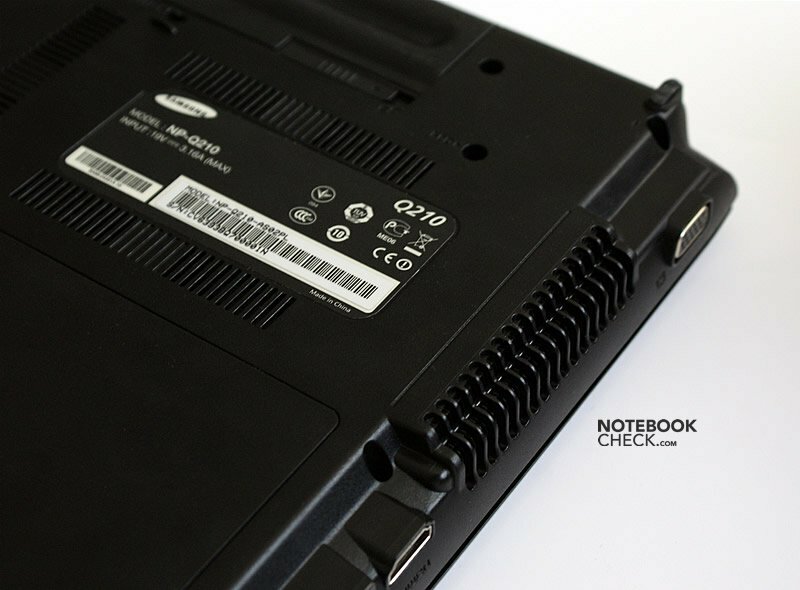 Regarding noise the Samsung Q210 is probably quieter than any other notebook with discreet graphics card. The warming up of the chassis is not a big issue even not in summer. 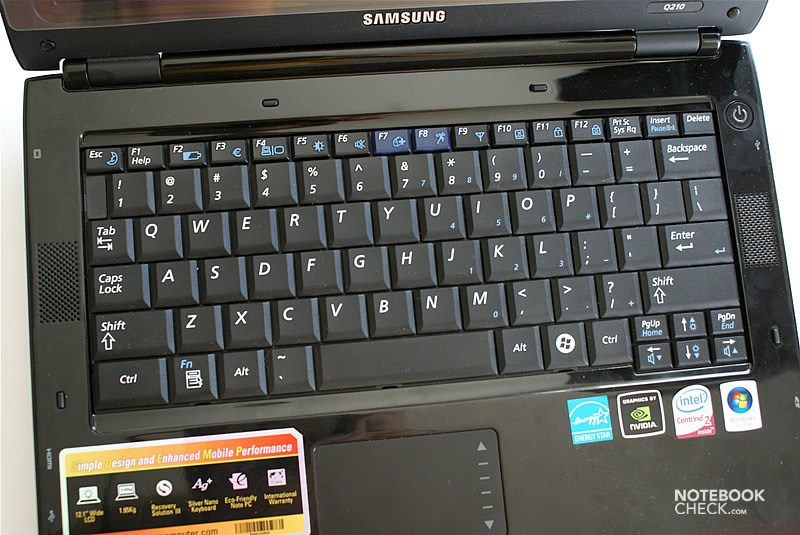 But the Samsung Q210 does warm up a bit even during light use, so the user cannot feel fully comfortable when keeping the notebook on the lap. However, this is only a slight inconvenience. Temperatures do not change much when working with demanding applications too: On the top and bottom parts of the base unit the temperatures only slightly exceed 40°Celsius. (-) The palmrests and touchpad can get very hot to the touch with a maximum of 41.3 °C / 106.3 F.
(-) The average temperature of the palmrest area of similar devices was 28.6 °C / 83.5 F (-12.7 °C / -22.8 F). Although the Samsung Q210 has two speakers they are feeble and have a very poor maximum volume. They cannot even a little bit compete with the quality of the HP Pavilion tx2550 speakers (made by Altec Lansing). 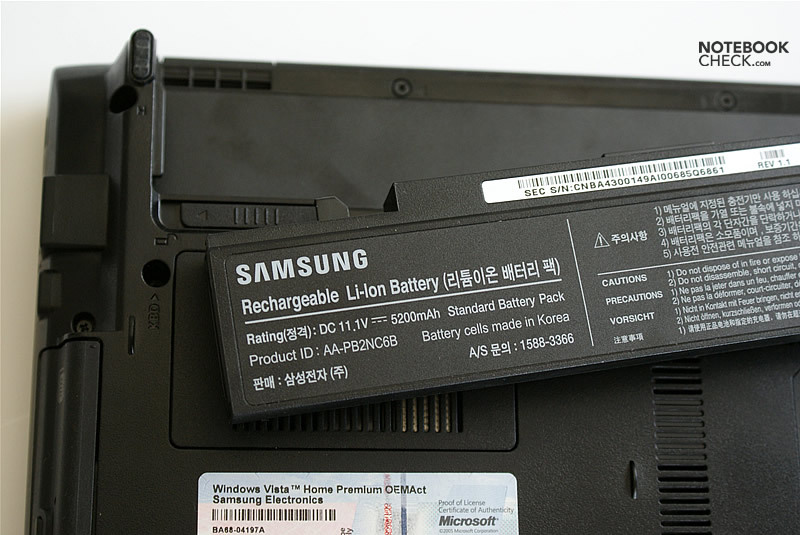 Samsung used a 6-cell battery with a capacity of 5200mAh (57.7Wh), which is quite a lot considering the fact that the same battery is being used in the larger and more powerful Samsung R560 notebook. The recorded times ranged from almost two to about six hours. With normal usage and activated WLAN connection, it will last for about three and a half hours. So although the battery life is not outstanding, it is sufficient long for proper mobile usage. What stands out is that the Samsung Q210 can operate in a really quiet manner. 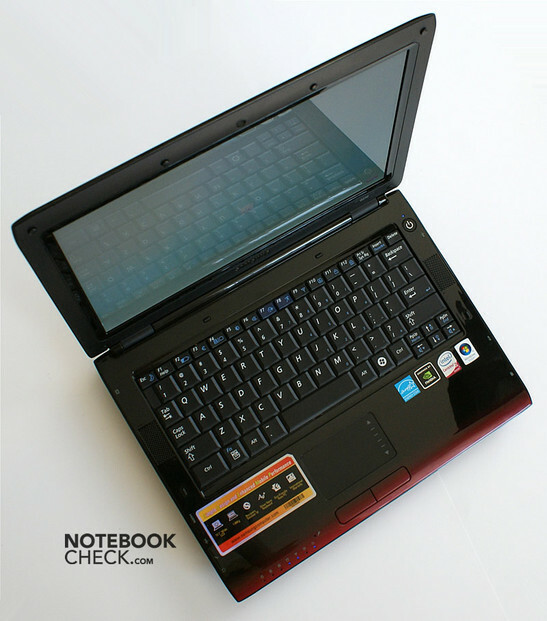 This valuable characteristic outshines other attributes of this subnotebook with 12-screen and dedicated GeForce 9200M GS graphics card. 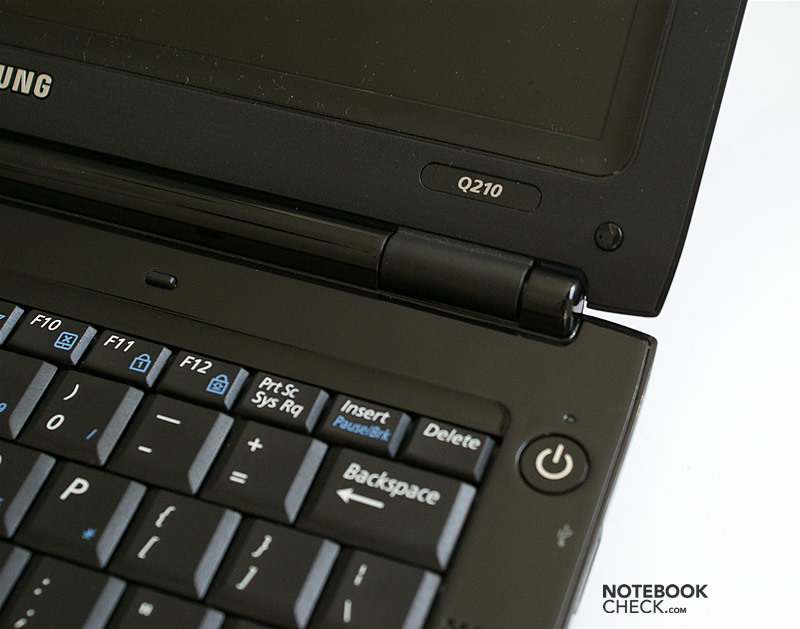 If you need a small laptop that is hardly audible, we can highly recommend this one. The main disadvantages of this notebook, which might discourage some from buying it, is the glossy coating of the lid and the top case, which are very sensitive to fingerprints. The case of the Samsung Q210 is not the most solid of all: It is satisfactorily rigid, but creaks in many areas. The screen is inferior to the one in some other small notebooks, but the difference is not at all that significant. In contrast the loudspeakers are really poor and will not be able to impress anyone. The Samsung Q210 has a pretty good battery life and manages three to four hours on battery. 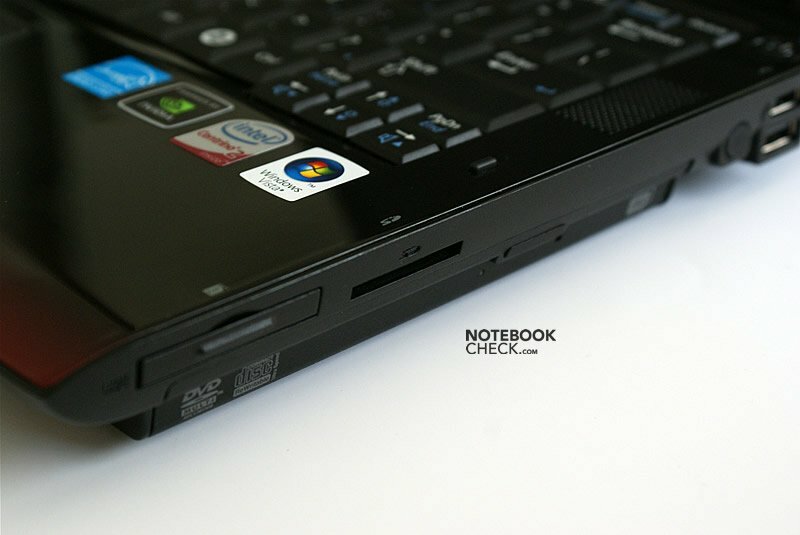 It is also one of the very few small notebooks that offer a dedicated graphics card, which proved to be better than our modest expectations by far, because it uses GDDR3 memory. 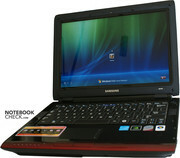 The Samsung Q210 is a notebook with a 12-inch screen and a dedicated graphics card. With the capacious battery the battery life is at least alright. The chassis does warm up under load, but not too much. One of the advantages of the Q210 is its very quiet fan. 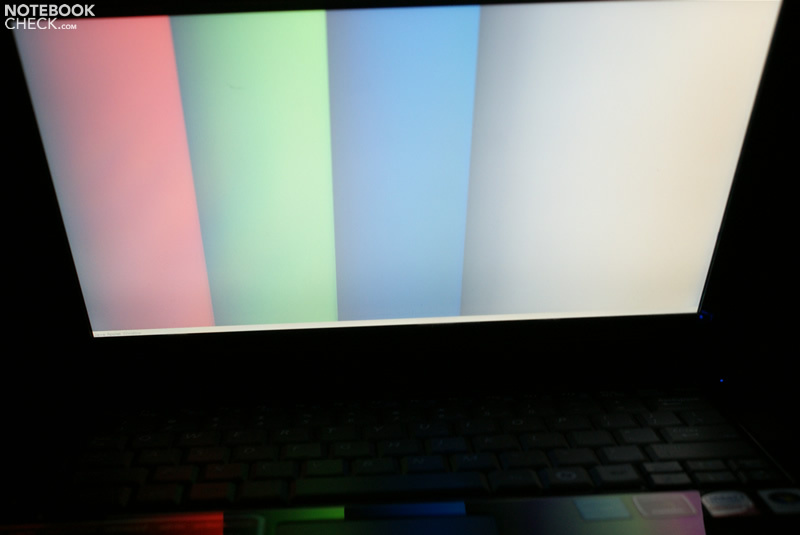 You can open the screen up to about 140 degrees. We liked that the audio ports are not on the front. The interface-alignment is quite convenient. 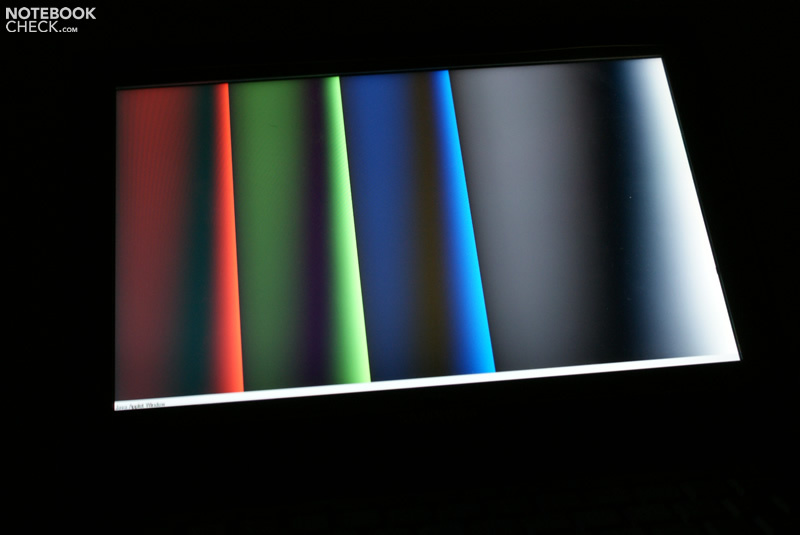 The touchpad is really good. 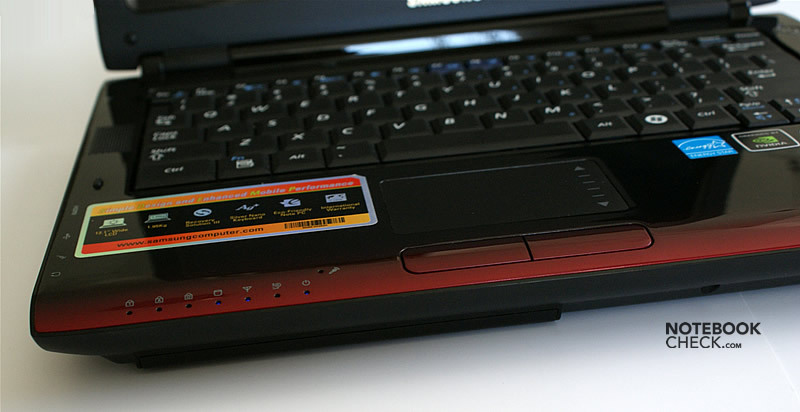 The shiny coating is sensitive to fingerprints and dust. It seems that glossy parts are everywhere. The chassis clearly creaks in many areas. The workmanship is not really great. The red stripe at the front is a characteristic of this notebook. The battery charge indicator is a nice feature.